VATICAN CITY (CNS) — In a Valentine’s Day ceremony to create 20 new cardinals, Pope Francis offered a meditation on Christian love and, especially, what it means for those who guide and minister in the church. “The greater our responsibility in serving the church, the more our hearts must expand according to the measure of the heart of Christ,” he said Feb. 14 during the consistory, a prayer service during which he personally welcomed 19 churchmen into the College of Cardinals. The 20th new cardinal, 95-year-old Colombian Cardinal Jose Pimiento Rodriguez, retired bishop of Manizales, was unable to attend the ceremony and was to receive his red biretta — a three-cornered hat — and his cardinal’s ring in his homeland. 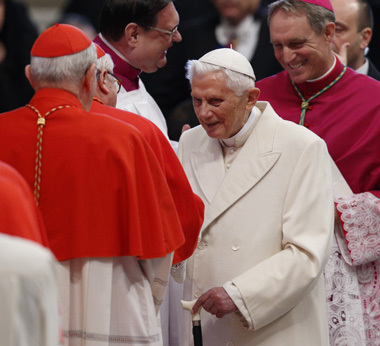 Retired Pope Benedict XVI attended the ceremony, sitting in the front row of St. Peter’s Basilica alongside the already existing members of the College of Cardinals. Not being “irritable or resentful” can be a challenge for a pastor, especially when dealing with other clerics, Pope Francis told the new cardinals. 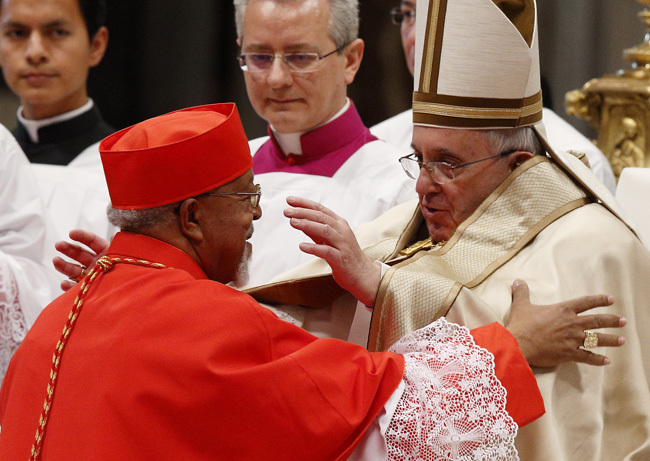 The 20 new cardinals come from 18 nations, including three — Cape Verde, Myanmar and Tonga — that had never had a cardinal before. Only one of the cardinals works in the Roman Curia: French Cardinal Dominique Mamberti, head of the Apostolic Signature, the Vatican’s highest court. With the creation of the 20 new cardinals, the College of Cardinals expanded to 227 members, 125 of whom are under the age of 80 and therefore eligible to vote in a conclave to elect a new pope. After the new cardinals professed their faith by reciting the Creed and formally swore fidelity and obedience to the pope and his successors, they approached Pope Francis one by one to receive their biretta, their cardinal’s ring and the assignment of a “titular” church in Rome, which makes them part of the Roman clergy. — Blessed Jeanne Emilie De Villeneuve, the French founder of the Congregation of the Sisters of the Immaculate Conception. — Blessed Mary Alphonsine Danil Ghattas, the Jerusalem-born founder of the Dominican Sisters of the Holy Rosary of Jerusalem, the first Palestinian religious order. — Blessed Mariam Baouardy, a Melkite Catholic member of the Discalced Carmelites. She was born in 1846 in Ibillin, in the Galilee region of what is now Israel, and died in Bethlehem in 1878. The pope announced the canonization ceremony will be held May 17 and also will include the canonization of Italian Blessed Maria Cristina Brando, founder of the Oblation Sisters of the Blessed Sacrament.